I feel less guilty flying on vacation now that I’ve compared flying with driving by car. Both contribute to global warming about the same. My burden of guilt might be reduced even further. Canadian airlines are looking at using renewable energy rather than fossil fuels. (Globe and Mail, July 25, 2107)”. Air Canada has flown eight times on biofuels, most recently from Edmonton to San Francisco on May 2, 2018. The flight reduced carbon emissions by over ten tonnes, a 20% reduction in net carbon emissions. This is equivalent to taking 26 cars off the road for a month according to Air Canada. They are careful to say that the growth of biofuels can’t come at the expense of food crops. That should be easy because some land that is unsuitable for food may be fine for biofuels. Even more arable land will come available because of global warming caused by people (gulp) going on vacation and spewing CO2 into the atmosphere. Air Canada has also improved fuel efficiency by 43 per cent since 1990 and they hope to be carbon-neutral by 2020. “These efforts and other green initiatives to increase efficiency and reduce waste were recognized by Air Transport World which earlier this year named Air Canada the Eco-Airline of the Year for 2018,” they say. Planes are becoming more efficient. That, combined with cleaner burning biofuels can reduce air pollution. According to NASA, a mixture of 50% aviation biofuel can cut air pollution caused up to 70%. If I flew on a plane that used solar, electric or hydrogen fuels, that would be even better. But for now those sources don’t have the power necessary to launch commercial airplanes. I could also buy carbon offsets to pay for my sins of emissions. 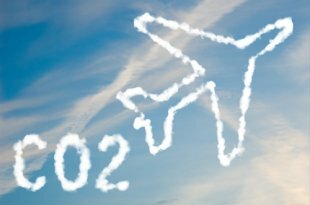 WestJet has teamed up with Carbon Zero. Their calculator shows that my return trip to Puerto Vallarta, Mexico, generates 0.65 Tonnes of CO2. For an additional $14.69 I can contribute to an equal reduction of greenhouse gases. They offer two projects. One is diversion of organic waste from a Toronto landfill which prevents methane from escaping into the atmosphere. That’s good: methane is an even worse greenhouse gas than CO2. However, while I may feel a little better, carbon offsets are a drop in the bucket. Offsets nowhere match the amount of carbon going into the atmosphere. In addition, carbon offsets only appeal to people who worry about such things. For those who don’t think that humans contribute to global warming, offsets may look like a scam. No guilt would better than reduced guilt but I can console myself, somewhat, by comparing myself with those who don’t give it a fleeting second thought.